Your name is Roarke, and you've been give the task of dealing with an evil corporation with your partner Yakecan, thus saving the New American world from Damnation. Previews showed us vertical action, gun fights, and daring feats both in vehicles and on rooftops. Enticing to the Co-op world, Codemasters appeared to cover a wide variety of gameplay elements, we couldn't wait to get our hands on this one. 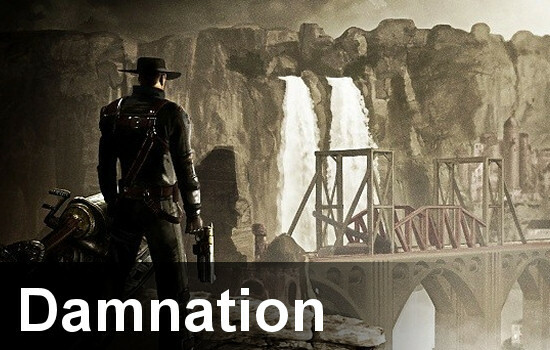 But does Damnation do the Steampunk brand justice, or does Damnation live up to the definition of the word? If you were to stumble upon a trailer, or posters for Damnation, you'd likely think you were in for a treat. Vast, beautiful landscapes and a formidable looking hero duo, with just enough flare from the Steampunk art style to perk up many hopes. Judging books by covers is frowned upon at an early age, and yet we never seem to learn. 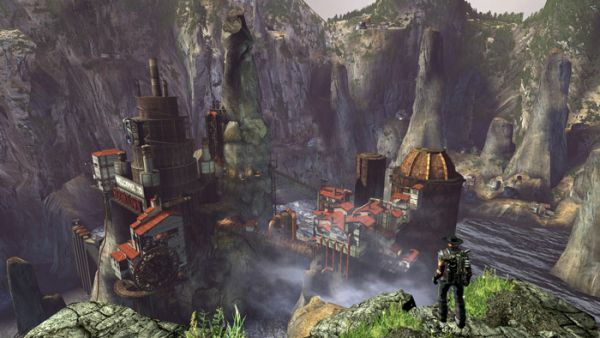 Upon actually picking up this game, we quickly discovered how much effort went into creating the extensive vertically explorable world, and how neglected everything else was. The first negative point we noticed was the forced voice acting, which probably comes from working with a shallow script. Any depth that may have been in this story was lost in the dialog, but from what I gathered while playing: The evil Prescott corporation is doing some bad things in the mining town of "Boomtown". The overhead speakers in some of the mining areas coax workers to work harder in exchange for a serum that makes them stronger, faster, and more retarded than the average bear. Had I not experienced the single player, I'd have assumed the Serum was responsible for how poorly the enemies responded to my presence, rather than the terrible AI. For the record, your partner Yakecan, has some serious issues if left on her own. The AI was so atrocious, she wasn't even around half the time, then would appear when I hit an (already cleared) area. The one thing co-op does for sure, is eliminate your partners special needs program. Unfortunately with all the glitches we experienced in the game, having a second player simply means discovering new ways to get stuck in walls, fall through bridges, or even completely break the game as my Co-op partner Arttemis and I managed to do. By the end of Act 2, we had managed to clear out an area with a few levers. In the spirit of Co-op, each of us hit 2 of the 4 levers. Unfortunately, the game didn't agree with that one bit, and we were left with completed objectives, and could not continue the game. Though, to be honest, without a map or guide markers of any kind, the direction given in this game was slim to none. Eventually you're given a spirit power, which highlights allies and enemies in an area. This will be your only guide in the sense that: If there are enemies there, you haven't been there yet. Check Out Behind The Scenes In Damnation. Page created in 0.7279 seconds.